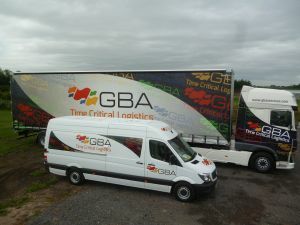 European logistics operator GBA Services is spending over £4 million on its largest-ever vehicle purchase. It comprises 20 DAF XF106 double sleeper tractor units, 30 low-mileage used units for a new contract, 15 brand new Lawrence David Tall-boy 4.65m high pillarless curtain-side trailers, 30 Mercedes Sprinter vans, six of them refrigerated. Many are left-hand-drive for allocation to GBA’s European stations in Germany, Poland, Austria and Portugal.